Yesterday was my second time at Cafe Henri, and just like in my last visit, I was very satisfied. 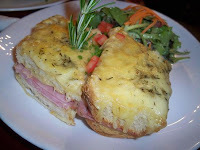 It was easy to make a decision because I was in the mood for something traditional and classic--the Croque Monsieur sandwich. 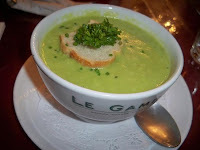 I also started with the day's special, a thick pea soup with a crunchy crouton on top. Pureed Pea Soup - I'm a sucker for good soups, especially pea soup because it reminds me of my childhood. Cafe Henri's version was the perfect way to start a meal because it was comforting, with a nice smooth texture. There were some chunks of peas in it too that were welcome--they were a hidden surprise at the bottom of the bowl. The crouton that was floating on top was delicious and it was fun to break it up and watch it soften up in the bright green broth. Croque Monsieur - First-off I loved the crusty peasant bread that the sandwich was presented on. While crispy, it wasn't too hard, making it easy to bite into. I loved that there were plenty of rosemary flakes on top of the bread and also a fresh sprig for garnish. The ham was lovely, decadent and slightly sweet while the gruyere cheese that stretched beyond its bread borders was light, salty and a bit tangy. 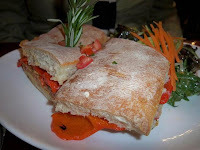 Le Merguez Sandwich - My dining companion ordered this and while I didn't taste it, it looked impressive, packed with spicy lamb sausage, roasted red peppers and dijon mustard. Again, the bread looked like it was of good quality and my dining companion finished it to the last bite. I'm quite curious to try it next time. Our waitress was friendly and very attentive. We felt well taken care of and there was always someone coming by to check if we were doing OK and if we needed anything else. They weren't annoying but definitely caring and polite. They were quick with the check yet didn't make us feel rushed. The costs here are gentle on the wallet. Our dinner including two drinks cost about $40 before tip. Tre bien!